WILSON, N.C. -- A tweet from a local student on National Walkout Day has gone viral because of the number of people who participated in walking out with him -- zero. Justin Blackman walked out of class at Wilson Preparatory Academy on Wednesday, as did students all over the country, to protest gun violence after last month's mass shooting at a Florida high school that killed 17 people. But when Blackman got outside of his school, he realized he was the only one participating. 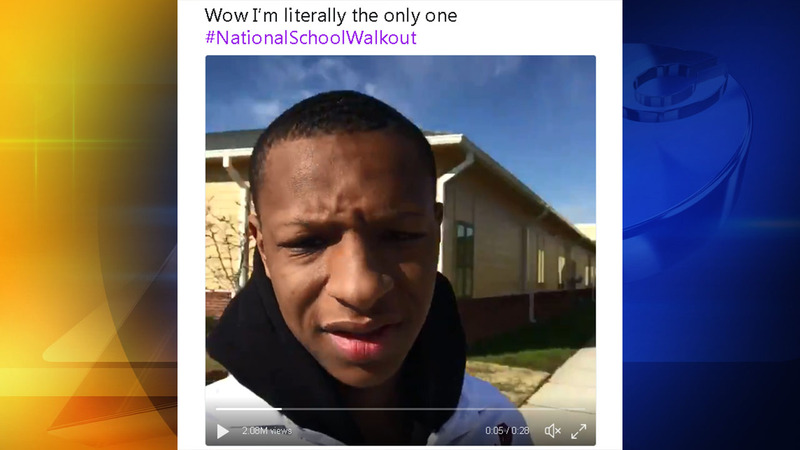 He posted a video on Twitter, saying: "It's National Walk Out Day and I'm the only one at my school out here." Since then, the tweet has gone viral. As of 5:45 p.m., the video had two million views, more than 22,000 retweets and 100,000 likes. In the video, Blackman said his teacher let him leave class. Janet Conner-Knox, who handles public relations for Wilson Preparatory Academy, told CNN: "We teach our students to be independent thinkers. (Blackman) is an independent thinker." Click here for a look at recent stories about gun violence. Thanks to all of who have reached out to ABC7 News about events at your schools. Please share your experiences with us on Twitter, Instagram, or Facebook by tagging them #WalkoutBayArea so we can feature them on TV or online. Thousands of Bay Area students walked out of class on Wednesday as part of a nationwide day of action against gun violence.